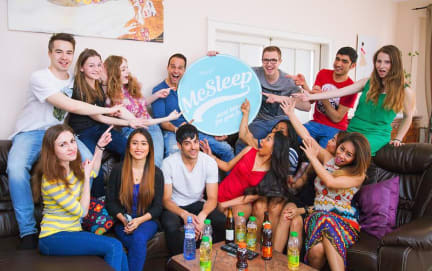 McSleep Hostel Prague i Praha, Tsjekkia: Bestill nå! This was honestly the most luxurious hostel I've ever even heard of. The staff was amazing, the hostel looked and was absolutely incredible. It's like a 4 minute walk from the Bus station, which is why I picked it (to Prague late and left early next morning). But honestly, this hostel was like a great apartment. Not ideal if you're in Prague to explore, cause you might end up chilling on the couch in front of the TV. GREAT place though! The street it's on is a bit creepy, but the rest is perf.